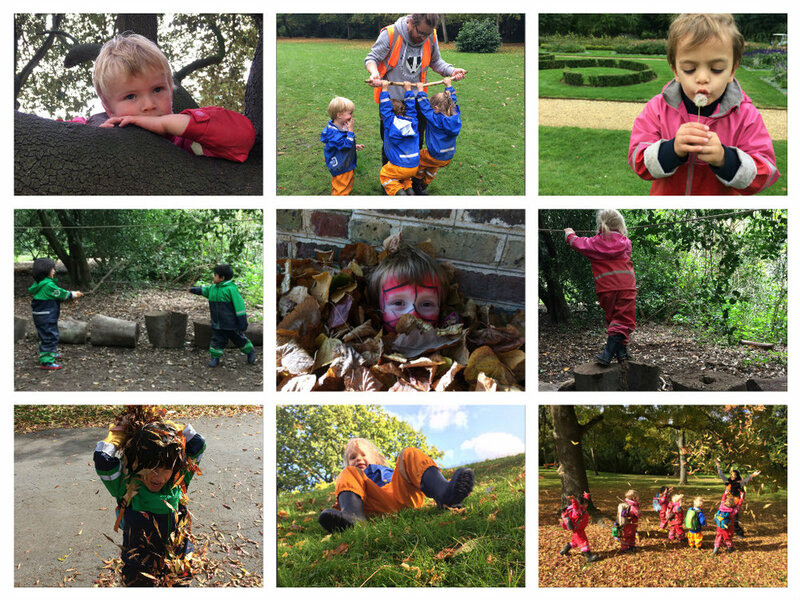 Each season brings different and amazing opportunities for play. Only a few months ago the forest was filled with blackberries which were a delight to cook with. Now the last signs of summer are fading and the forest floor is strewn with leaves. Autumn is definitely here now. Both Kew Gardens and Chiswick House and Gardens are awash with the colours of Autumn. From the moment we arrived at Kew on Monday the children were talking about visiting the badger sett. We reminded them that it was a long walk and we would need to set off straight after snack to make it for lunchtime. Yet we couldn’t help but stop along the way when we saw the Autumn leaves covering the park floor. Without even taking the time to remove backpacks the children were hastily collecting as many leaves as they could hold and throwing them up in the air, watching as they floated back down on top of themselves. There were leaf wars as the adults and children alike hastily collected as many leaves as they could to throw back and forth at each other. We even tried to build a ‘leaf man’ although leaves are a lot harder to mould then snow! In the end, we did make it to the badger sett. Back at Chiswick we decided to spend the day at the rolling hills and were delighted to find the valley full of Autumn leaves. As soon as snack was over the children gravitated down into the valley to use their ‘broomsticks’ to sweep up the leaves, kick them up in the air and roll down into them. It wasn’t long before we were all working together to create an enormous pile of leaves for jumping in. We found lots of different ways of transporting the leaves, from using our hands to scoop them up, our feet to kick them along, sticks to sweep them along and finally a large crate to collect and transport them. When we deemed that the pile was large enough the children jumped in and enjoyed burying themselves underneath the leaves and calling out where they were. There was an assortment of limbs dangling from different parts of the leaf pile although it was hard to see where all the children were. Their enjoyment and excitement was abundant. Some of the children began to give themselves a leaf bath, using handfuls of leaves like soap and washing their arms and bodies. We went back to visit the allotment this week. Although the flowers are still in bloom and looking beautiful there is a lot less for us to eat now. We managed to find a few courgettes and purple beans and noticed that the pumpkins are ready for picking. The children talked about there being no tomatoes left and it is great that they have remembered and enjoyed what they have grown this year. We examined the difference between the pumpkins and the butternut squash. One child remarked that the shape of the butternut squash looked like an aubergine. So, we took the children to the melon house to see the last of the aubergines and talk about the differences in the appearance of both vegetables. By chance the lunch was butternut squash and coconut soup, so we were able to taste the squash just after we had seen it in the allotment. It was very tasty! Our physical skills have been thriving this week. We have been working our upper body strength, climbing up rope ladders between the trees and pushing ourselves to complete a series of slackline challenges that included balancing across logs of different shapes and sizes. It is great to see the confidence and capability of the children grow as they are exposed to such challenges over time. We have continued with our helicopter stories this week and enjoyed listening to a few courageous children share their stories. The children have been eager participants in acting out their own and other children’s stories. This week the stories were about naughty trolls, Santa and a princess who was getting married. Hopefully as we continue to encourage and share the children’s stories we will begin to hear more children’s stories in the forest.